By demand we created these new Central channel loudspeaker for home cinema created specifically for discerning ears that do not compromise in quality, power and sound pressure. The power of 300 W RMS make these home theater speakers a milestone of Garvan products. With our in-wall sound diffusers, central channeled, with a D’Appolito configuration you can realize your personal home entertainment center. In the continuous search to satisfy every need, Garvan “knocked on the door” of houses where there isn’t the opportunity to make structural changes, creating a series of steel in-wall speakers ideal for flush installations on walls and plasterboards. The speaker box is made of marine wood, ensuring a high rigidity and the possibility that concrete grips perfectly without bulges. Almost all of the boxes have a 7.6 cm depth flush wall, designed to be also installed in hollow bricks of 8 cm without having to break the last slab. 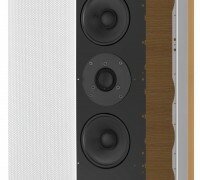 The speakers, in part also used in the flat series and bookshelf series, are designed to play in small spaces, offering to the listener a unique involvement. The structure of these speakers is made of steel in order to obtain high rigidity and ensure an interference-free musicality. The design of these loudspeakers are the same as the design for plasterboard and flat loudspeakers and are secured by powerful neodymium magnets that provide the ability to fit perfectly flush with the wall. Garvan, thanks to the practical mounting system of the aesthetic cover and the wide range of possibilities to customize the speakers, creates solutions for every need.